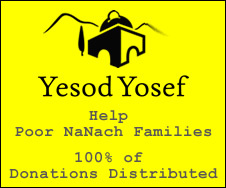 Na Nach Nachma Nachman Meuman: Nanach to the rescue - of the entire world! Nanach to the rescue - of the entire world! In former good times when the christians (hate using this filthy name, but I have to give them full credit here), muslims, and all their type, murdered Jews they had to do it up close, by hand, one by one. That made massacres of "mere" tens of thousands (as for example in Uman where Rabbainu is buried) in some ways much much more brutal than the millions butchered by the germans ym"s - although the truth is that they did plenty up close by hand as well. Killing someone from a distance with a gun for sure is very cold blooded, barbarous, brutal, callous, cruel, dispassionate, heartless, inhuman, merciless, pitiless, ruthless, savage etc., however it's not the same thing as actually sticking a knife into a person and cutting off the person's life. Even less so is murder by a bomb, where the murderer might not even have to witness in any form the fruit of his cruelty. If you take a look at a killer who can actually approach an infant and stab the child to death, this is obviously not a normal person who just hates Jews, this is a very sick individual who is obviously full of hate and has absolutely no appreciation or consideration for any life or goodness. When people cheer and celebrate such acts, they also show that they are unnaturally suffused with hate and kind of psycho. Even before Rabbi Nachman forbade the hitting children, and "paches" (smacks) were not uncommon - which parent would hit a child in the head?! Where do you see grown adult constantly at each other's necks, even if it's just "play fighting"?! If you take a little stroll in the Arab market, it won't take long till you see this first hand. Nothing to do with Jews, just look how they treat one another (after they kiss each other of course etc. and sell their daughters to the highest bidder). If I'm not mistaken, there's an arab custom to fire a gun at a wedding, what a way to start a new family!!! People frequently ask me how I get along with the arabs, especially since I used to live in the Arab quarter, and for the sake of peace I usually just say OK. But the truth is that the trauma the children in Itamar are experiencing now after seeing their parents and siblings have their throats cut, is a daily trauma experienced by the arab children who undergo the abuse of being brought up by parents steeped in perverted tendencies and character. Much worse than the atrocity of their terrorism, is the nightmare of their own conduct, how they breed their own "civilization". Thank God in our times, with the spreading of internet and social networks, and with the spreading of programs like alcoholics anonymous, people are beginning to learn to extract the hurt from inside and seek help with others. True the arabs aren't so quick to catch on, but B"H we do see that it has reached them and they have started to respond. Never give up. So as you see, ultimately the fault or responsibility is ours. The Nanach have to show the world how good it is to be happy and believing, simple and honest, compassionate and caring, and helpful and active.